Winter Harbor, Maine, a classic Down East fishing village in Hancock County in the U.S., got its name for the harbor not freezing over in winter. For obvious reasons, this made it a much desired port for the local fishermen and today, it still has a fully active fleet of lobster boats and scallop draggers. Originally part of the town of Gouldsboro, it separated and became incorporated in 1895. The year 2010 census placed its year-round population at 516. This is almost a 48% drop in year-round population when compared to the 2000 census and can directly be attributed to the closing of a naval facility in 2002 when the population dropped almost instantly to 492. A very attractive section of the town is called Grindstone Neck. Its western shore provides spectacular views of Bar Harbor and several of the mountains on Mount Desert Island. The southern part, called Grindstone Point, has views of Mark Island Lighthouse, Ned Island, Turtle Island, and Schoodic Peninsula. Schoodic Peninsula, part of Acadia National Park, covers the southern section of the town. 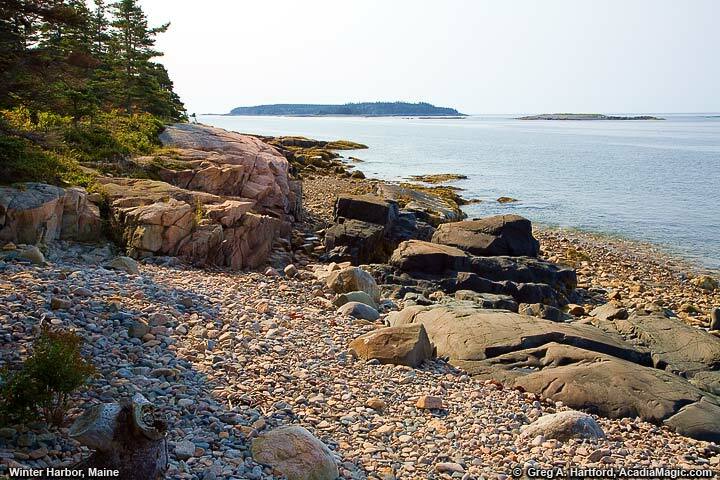 This is the only portion of Acadia National Park that is on the mainland of Maine. The majority of the park is to the southwest on Mount Desert Island. View Winter Harbor Light Station. 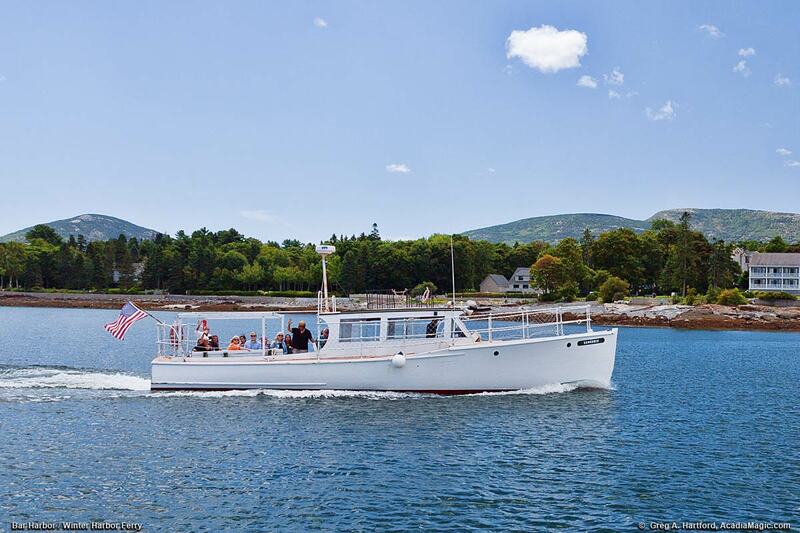 Beginning in 2016, there will be two options for ferry service between Winter Harbor (on the mainland) and Bar Harbor (on Mount Desert Island). These are theBar Harbor Ferry and the Schoodic Ferry. From the Winter Harbor Ferry Terminal, the Island Explorer bus service provides seasonal transportation to Winter Harbor, the villages of Prospect Harbor and Birch Harbor, as well as to Schoodic Point in Acadia National Park and the new Schoodic Woods Campground. 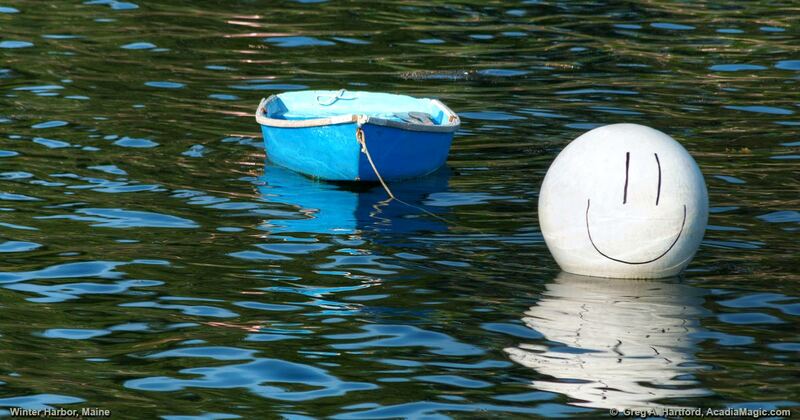 Winter Harbor Maine is one of the significant points on the Schoodic Scenic Byway. To get there from Ellsworth, follow Coastal U.S. Route 1 East, then take Maine State Highway 186 south. If leaving Acadia National Park's Schoodic Peninsula, take a left in Birch Harbor onto Highway 186 to return to the town center. Police & Fire Dept. : Dial 911 for Emergencies. 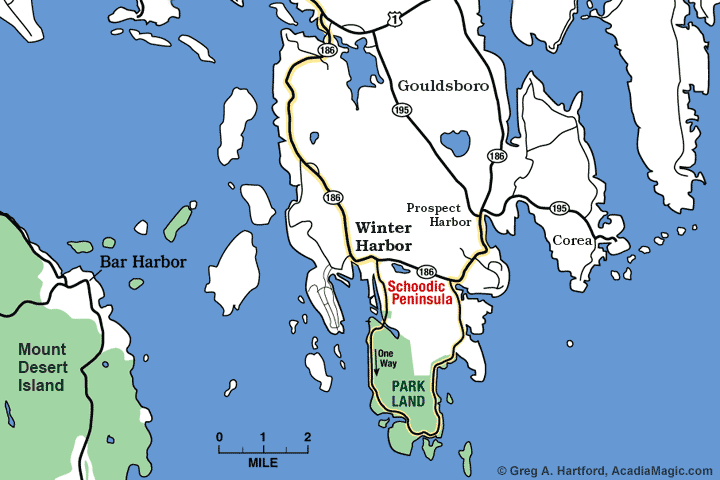 The main host town of Acadia National Park at Schoodic Peninsula is Winter Harbor, especially if arriving from the western side. Besides the stunning sights in the National Park, there are several areas to check out in Winter Harbor. Rather than taking a left when arriving in the town center, consider taking a right to see what is on Main Street. There are several nice shops and galleries. Up ahead on the left is Harbor Road. This short road goes to the dock and harbor where the lobster boats are. If you want some nice shots, this is one of the places. Further ahead on Main Street there are a couple of lefts that will go to Grindstone Neck - Beach Street and Grindstone Avenue. You will find some fantastic viewing spots on the eastern and southern sides.